I've just read Drinking tap water in India, which has some mixed messages (in different answers) regarding tap water safety in different locations and conditions in India. Now, I'm traveling to a conference to be held in the Gurgaon area, near the New Delhi airport. I'm going to be there for a little over a week, and mostly in the hotel where the conference is held and my own hotel. Which of these places are going to be safe for me to drink water from? What about brushing your teeth rather than drinking? Is it the same rule for water safety, or is brushing safer because you don't ingest a large quantity of water? Where should I get water? Should I look for someplace which sells large(ish) water bottles, or just buy half-lifter bottles repeatedly? I've lived in India for almost five years now, and I believe it's better to err on the side of caution here. For drinking water, stay away from all fountains, taps and the like. I would stick to this advice even in the airport and at hotels. Also use bottled water for brushing your teeth. Buy bottled water of a known brand. 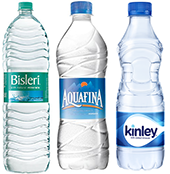 (Bisleri, Aquafina, Kinley.) It's preferable to get them from a large supermarket or other trusted source, to avoid counterfeit bottles. Your hotel will probably sell them. Make sure the caps are sealed. 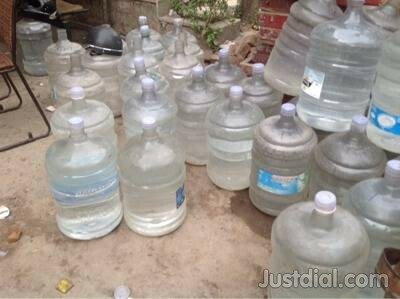 You can typically get 5L or even 10L bottles. If you do this, though, make sure you don't get the type where the same bottles are reused, as the refilling process can often be unhygenic. Below is a picture of reusable bottles that you want to avoid. They feature quite sturdy plastic. These are 20L, but smaller varieties and shapes also exist. If they ask for a deposit on the bottle, and the bottle is exchanged back for another bottle after use, then you know you're dealing with reusable bottles. Some of my friends have had water tests done of the reusable bottles (of a known brand) and found that they are more likely to contain various bacteria. The tests of the disposable bottles, on the other hand, turned out fine. If there is no deposit on the bottle, then you know that each bottle is new. Stay away from reusable bottles, even from known brands. Any local refilling facility may or may not have their procedures in place. This bottled water is quite cheap here. A 1L bottle costs €0.26. A 5L bottle costs €0.87. Personally, I have my own RO system, UV filter and ozonizer, but that's usually not an option for short-term visitors. 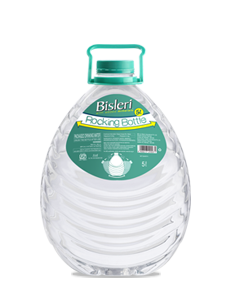 Since most of the bottled water here is RO processed, it's good to choose a type that has added minerals in it (Bisleri, Kinley). The RO process removes all bacteria and harmful chemicals from the water, but it also removes all the useful minerals. Both water fountains and bathroom taps are probably risky - even water that is clean and safe for those living there might cause a traveler distress, because of local adaption. You might, if your hotel is reasonably fancy and well rated, ask if they suggest using bottled water or if the hotel water sources are safe for travelers - if they are, it would be a selling point, otherwise, they will emphasize bottled water available on demand - I doubt they will be offended if you inquire politely. Getting bottled water is generally a safe choice - you will want bottles with good seals, preferably from reputable sources. It probably is wise to have larger bottles, when you have someplace to put them (hotel room), otherwise smaller bottles are convenient to carry - though refilling smaller bottles from a larger is probably cheaper, as long as you're sure of the original bottle. When we used to travel to India, we always drank boiled or bottled water. Anecdotally, we didn't have problems with brushing our teeth, or with the residue of water on our hands from washing with un-boiled water, it may have to do with the amount being consumed - although you can of course use bottled water if you wish to be safer. You may wish to avoid chutneys or other cold sauces, they are often ground with cold water (and not cooked), but other food is cooked to safe temperatures and usually safe. Coffee and tea are both usually quite safe, the cultural convention is for heavily brewed and boiled for a concentrated extraction, then diluted to serve - unlike the more western habit of brewing delicately and at precise temperatures. Juices may vary - anything concentrated and diluted will have water in them, but bottled ones may be safe because of their processing. Very fresh juices may be safe, like pure sugar cane juice extracted form a machine, or young coconut water which is cut open in front of you - where there's no extra water added. Also, they're nice experiences. Sodas are processed and will usually be safe. You may also want to be wary of ice, since it is not usually made from boiled water. It's not necessarily that everything is dangerous and you will get sick if you mess up, just that these things might be a risk, and you should be aware of the risks you choose to take - sometimes it may very well be worth its risk. You have not just the bacteria to worry about but also minerals etc. because some waters are notoriously hard or have other toxics like PCBs, metals etc. Ergo, it is best to entirely avoid tap / fountains etc. especially as a short term visitor. You have neither the time to get your system adjusted nor the luxury to recover even a mild bout of stomach problems. Stick to bottled water. It is available plenty & almost everywhere. Even Indians, at least the middle class, will often drink Bottled Water when outside their comfort zone of locales. At the low cost, 0.20 cents for a 1 Litre bottle, you hardly have to worry about the cost of bottled water. No need to cart around huge bottles unless you expect to be in a remote area. Since you will stay in a hotel for most part this is moot. Most people will get by buying 500 ml or 1 Litre bottles. Buy from reputed stores. Stick to the big brands (Bisleri, Aquafina, Bailey). Carefully examine bottle seals. Unfortunately bottling has become a cottage industry & with tough competition sometimes you may have to shop around a bit till you find a store that stocks a good brand. What is less appreciated is that even the same brand will outsource the bottling operation at hundreds of local bottlers not owned nor operated by the company. If you carefully read the label you will discover this. Ergo, the same "Aquafina" may be of varying quality (in practice) depending on where it was bottled. Not much you can do about the choice of bottler. But maybe buy near the big cites because bottles sold there are more likely to be bottled in a company owned facility or at least one of the better, more closely supervised bottling plants. Avoid like the plague any hint of a refillable bottle. The large bottles (2 L plus) are very often the refillable variety. I'd rather drink tap water thank anything that came from a re-fillable bottle. Even an Indian tap. Another monstrosity you try and avoid is the RO / Filtration / UV plant in a public place. It is deceptively reassuring. Typically, all money is allocated to purchase and none to maintenance. You'd be lucky if the filter was cleaned in the last year. I wound't worry about the brushing part. I think the chances of catching anything that route are negligible. Unless you are living in the middle of a gastro epidemic. Or are brushing with raw river water or something. People worry too much about water and not enough about other food items where waterborne contamination is likely. (e.g. ice creams, sherbets, salads, water-diluted-drinks, juices). I'd avoid any of those (fine, unless they came out of a tetrapak from a brand you trust). Hot drinks are only safer than cold if the preparation involves extended boiling, not otherwise. I've been to India once and have been sick (water or food I don't know). As far as I remember, in Mumbai airport there were no water fountains; maybe it is different in New Delhi Airport. Drink only from sealed bottles. If drinking tea or coffee, be certain that it is very hot (YMMV). Hotels will have bottles water available in the room and on demand. Your conference organisation will also probably have bottled water available. Depending on the hotel category (1 star, 2 stars, etc. ), they might have clean(er) water for the bathroom sink; if in doubt, use bottled water for that also. When showering, keep your mouth closed. Here is a recent article on the subject in the Times Of India. Not the answer you're looking for? Browse other questions tagged india health food-and-drink tap-water new-delhi or ask your own question.